Wouldn't you just love a job that encourages you to use your imagination and lets you play with cool gadgets all day? 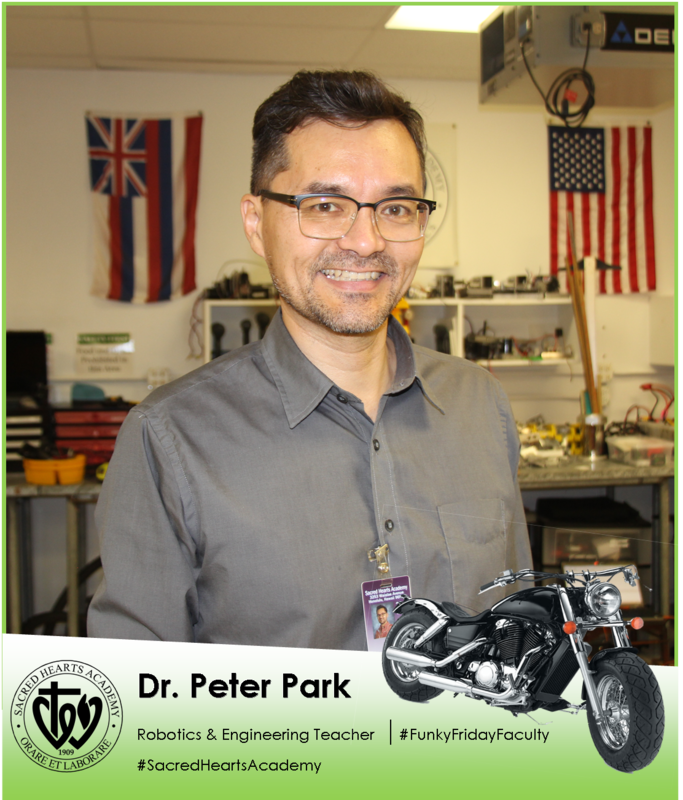 Dr. Peter Park, Sacred Hearts Academy's Robotics and Engineering Teacher, doesn't need to wonder - he lives it every day in the Academy's two Robotics labs. His courses are so popular it isn't uncommon to see the lights on in the lab on weekends and holidays, the room abuzz with chatter from students, parents, alumnae, volunteers and mentors alike - you can't keep them away, Dr. Park's lab is a #STEM playground for all ages! When Dr. Park isn't in the lab; he often is found traveling the world: Korea, France, Sweden, Italy, Turkey and more! But what many may not know is Mr. Park's love of Harley Davidson motorcycles - his favorite mode of transportation to and from campus. He aspires to go on a few iconic motorcycle road trips; one on Route 66 from LA to Chicago and another in France through their beautiful vineyards. We all admire Dr. Park's ability to nurture Academy students' interests in engineering, coding, designing and operating robots, through lessons and activities intended to encourage collaboration, research and problem-solving! We wish him and his students the best of luck as they put their skills to the test as they compete in the many local, national and international Robotics and Engineering competitions happening this school year! Play awesome mini learning games with your collection of words. downlodable serial numbers -When you click "SAVE," a "Date & Time" impression is stamped, so you can track your edits.